4) latent, where individuals possess genetic compatibility with celiac disease and may also show positive autoimmune serology, that have a normal mucosa morphology and may or may not be symptomatic. Determination of serum levels of immunoglobulin A (IgA) anti-tissue transglutaminase (anti-tTG) is the first choice in screening for celiac disease, displaying the highest levels of sensitivity (up to 98%) and specificity (around 96%). 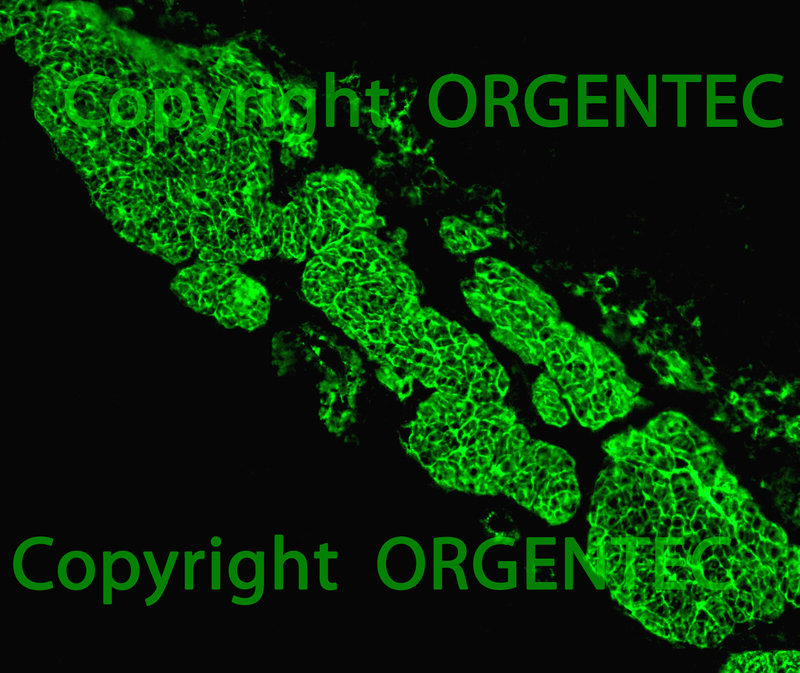 Anti-endomysium IgA-antibodies (EMA-IgA), on the other hand, have close to 100% specificity and a sensitivity of greater than 90%. The interplay between gliadin peptides and tTG is responsible for the generation of novel antigenic epitopes, the tTG-generated deamidated gliadin peptides. Such peptides represent much more celiac disease-specific epitopes than native peptides, and deamidated gliadin antibodies (anti-DGP) are promising serological markers for celiac disease. Serology has also been employed in monitoring the response to a gluten-free diet – the very effective but until now also the only possible treatment of celiac disease. Despite of this large inventory of powerful tests, serological screening has been utilized primarily to identify those individuals in need of a diagnostic endoscopic biopsy, and diagnosis of celiac disease has still rested on the demonstration of changes in the histology of the small intestinal mucosa: The classic celiac lesions with histologic changes of villous atrophy, crypt hyperplasia, and increased intraepithelial lymphocytosis. With a view to bring together the results of two decades of intensive research in a balanced and up to date diagnostic scheme, that helps to avoid unnecessary biopsies and laboratory tests, the ESPGHAN charged a working group consisting of 17 well known experts with the development of new guidelines for the diagnosis of celiac disease. On the basis of a recently published detailed evidence report on antibody testing the working group compiled an updated definition of celiac disease and formulated new guidelines. Major changes where made concerning the claim for duodenal biopsy: the working group defined subsets of patients for whom biopsies where avoidable. Different diagnostic approaches are recommended for varying groups of patients stratified according to symptoms and clinical presentation. 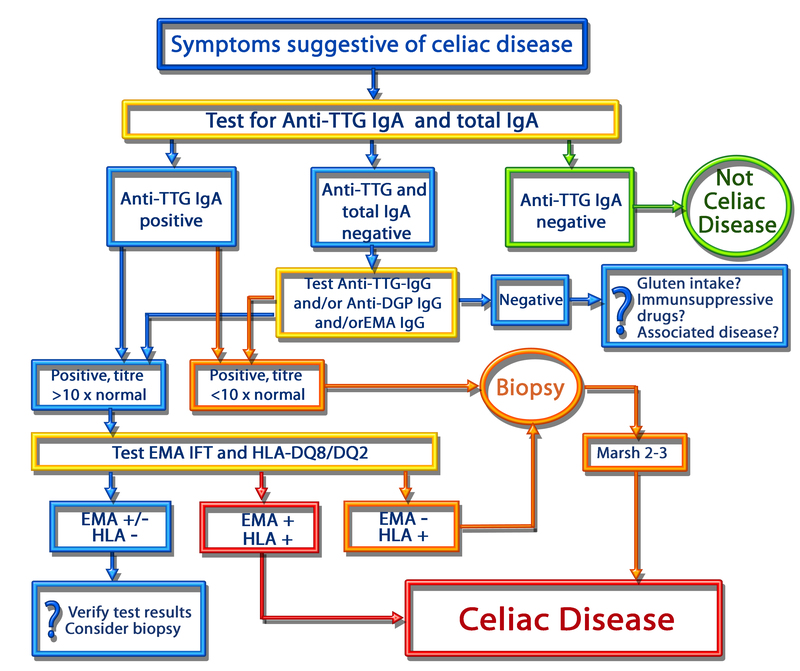 Celiac disease (CD) comprises intolerance against dietary gluten present in wheat, rye and barley, and it belongs to the most common food-related life-long disorders in Western countries, but also in India and the Asia-Pacific region, including Australia, Iran, Israel, New Zealand, Syria and Turkey. Nowadays celiac disease is conceived as an autoimmune-mediated systemic disorder, strongly dependent on HLA-DQ2 and HLA-DQ8 haplotypes, and commonly presenting as enteropathy in genetically susceptible individuals. Group 1 are symptomatic children and adolescents with the otherwise unexplained signs of chronic or intermittent diarrhoea, failure to thrive, weight loss, stunted growth, delayed puberty, amenorrhoea, iron-deficiency anaemia, nausea or vomiting, chronic abdominal pain, cramping or distension, chronic constipation, chronic fatigue, recurrent aphthous stomatitis (mouth ulcers), dermatitis herpetiformis–like rash, fracture with inadequate traumas/osteopenia/osteoporosis, and abnormal liver biochemistry. Group 2 are asymptomatic children and adolescents with an increased risk for CD such as type 1 diabetes mellitus (T1DM), Down syndrome, autoimmune thyroid disease, Turner syndrome, Williams syndrome, selective immunoglobulin A (IgA) deficiency, autoimmune liver disease, and first-degree relatives with CD. All tests should be performed in patients who are consuming a gluten-containing diet to avoid misdiagnosis. If gluten exposure was short or gluten had been withdrawn for a longer period of time a negative result is not reliable. In addition to classical ELISA-assays, rapid point-of-care tests are an alternative method for initial testing of CD-specific antibodies. However, results of rapid point-of-care tests (either positive or negative) should always be confirmed by a laboratory-based quantitative test. A test for CD-specific antibodies is the first step. The initial test should be IgA class anti-tTG from a blood sample. If total serum IgA is not known, then this also should be measured. In subjects with either primary or secondary humoral IgA deficiency, at least one additional test measuring IgG class CD-specific antibodies is recommended (IgG anti-tTG, IgG anti-DGP or IgG EMA, or blended kits for both IgA and IgG antibodies). Testing for antibodies against DGP may be used as an additional test in patients who are negative for other CD-specific antibodies but in whom clinical symptoms raise a strong suspicion of CD, especially if they are younger than two years. Tests for the detection of IgG or IgA antibodies against native gliadin peptides (conventional gliadin antibody test) should not be used for CD diagnosis; however, they may be valuable to document adherence to the gluten-free diet administered by the treating physician. If IgA class CD antibodies are negative in an IgA-competent symptomatic patient, then it is unlikely that CD is causing the symptom at the given time point. In seronegative cases for anti-tTG, EMA, and anti-DGP but with severe symptoms and a strong clinical suspicion of CD, small intestinal biopsies and HLA-DQ testing are recommended. When duodenal biopsies,that have been taken during a routine diagnostic workup for gastrointestinal symptoms, disclose a histological pattern indicative of CD (Marsh 1–3 lesions), then antibody determinations (anti-tTG and, in children younger than two years, anti-DGP) and HLA typing should be performed. In the absence of CD-specific antibodies and/or HLA-DQ2 or HLA-DQ8 heterodimers, other causes of enteropathy (e.g., food allergy, autoimmune enteropathy) must be considered. The clinical relevance of a positive anti-tTG or anti-DGP result should be confirmed by histology, unless certain conditions are fulfilled that allow the option of omitting the confirmatory biopsies. In children and adolescents with signs or symptoms suggestive of CD and high anti-TTG titers (levels >10 times upper limit of normal), the likelihood for villous atrophy (Marsh 3) is high. In this situation, the paediatric gastroenterologist may discuss with the parents and patient (as appropriate for age) the option of performing further laboratory testing (EMA, HLA) to make the diagnosis of CD without biopsies. Antibody positivity should be verified by EMA from a blood sample drawn at an occasion separate from the initial test to avoid false-positive serology results owing to mislabelling of blood samples or other technical mistakes. If EMA testing confirms specific CD antibody positivity in this second blood sample, then the diagnosis can be made and the child can be started on a gluten free diet. It is advisable to check for HLA types in patients who are diagnosed without having a small intestinal biopsy to reinforce the diagnosis of CD. HLA testing should be performed at first, because absence of DQ2 and DQ8 renders CD highly unlikely and no further follow-up with serological tests is needed. If the patient is DQ8 and/or DQ2 positive, anti-tTG IgA test and total IgA determination should be performed, but preferably not before the child is two years old. If antibodies are negative, then repeated testing for CD-specific antibodies is recommended. In individuals without clinical signs and symptoms, with an increased genetic risk for CD duodenal biopsies with the demonstration of an enteropathy should always be part of the diagnostic algorithm . To avoid unnecessary biopsies in individuals with low CD specific antibody levels (i.e., <3 times upper limit of normal), it is recommended that the more specific test for EMA be performed. If the EMA test is positive, then the child should be referred for duodenal biopsies. If the EMA test is negative, then repeated serological testing on a normal gluten-containing diet in 3 to 6 monthly intervals is recommended. If the diagnosis is definitely made the child can be started on a gluten free diet. The patients should be followed up regularly for symptomatic improvement and normalisation of CD-specific antibody tests. About twelve months after onset of the gluten free diet antibody titers usually decrease below the test‘s cut-off. If there is no clinical response to the gluten free diet in symptomatic patients further small bowel biopsies may be needed. Gluten challenge is not considered necessary except when there is still doubt about the initial diagnosis. Gluten challenge should be preceded by HLA typing and assessment of mucosal histology and always should be performed under close medical supervision. Despite the gluten-free diet being so effective, there is a growing demand for alternative treatment options. In the future, new forms of treatment may include the use of gluten-degrading enzymes to be ingested with meals, the development of alternative, gluten-free grains by genetic modification, the use of substrates regulating intestinal permeability to prevent gluten entry across the epithelium, and, finally, the availability of different forms of immunotherapy. The aim of the ESPGHAN’s new recommendations on antibody testing for the diagnosis of celiac disease was to achieve high diagnostic accuracy while reducing the burden of repeated duodenal biopsies for patients and their families. Now, these new guidelines must stand the test of clinical practice. 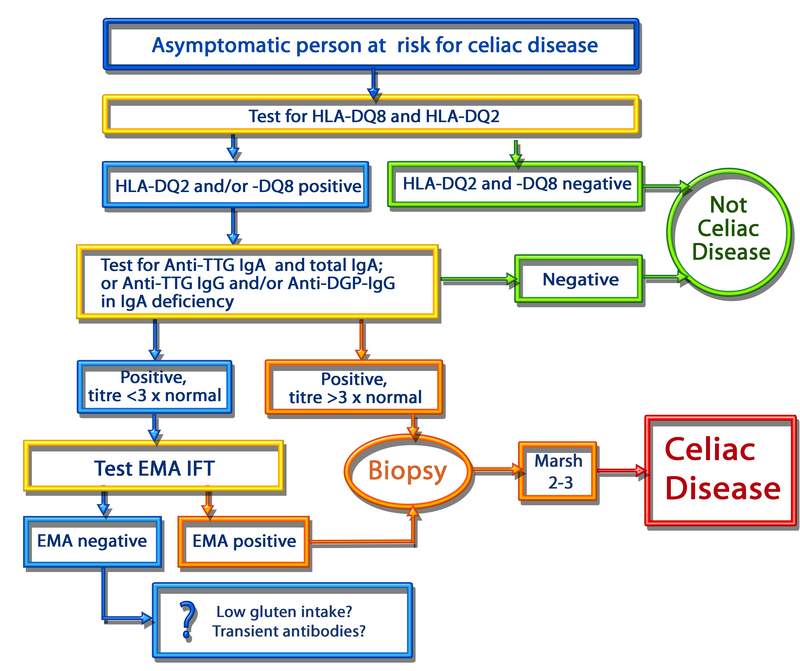 The working group defines celiac disease as an immune mediated systemic disorder elicited by gluten and related prolamines in genetically susceptible individuals, characterised by the presence of a variable combination of gluten-dependent clinical manifestations, CD-specific antibodies, HLA-DQ2 and HLA-DQ8 haplotypes, and enteropathy. Several classifications of CD have been used, most important with distinctions drawn among classical, atypical, asymptomatic, latent, and potential CD. Antibodies against tTG, EMA, and DGP are referred to as disease-specific antibodies and evidence has been accumulating on their diagnostic value. The leading role of histology for the diagnosis of CD has been challenged; diagnosis depends in equal measure on information from clinical and family data and results from specific antibody testing and HLA typing. In well defined cases serologic testing may replace histology.